Contrary to popular belief, getting married in Jávea is neither going to break the bank (we’ve heard ridiculous claims that all the paperwork would cost up to 3,000 euros to get married in Spain!) nor destroy the will to live with mountains of paperwork and insurmountable barriers of bureaucracy. With a little bit of patience and foresight, the procedure is simple enough to leave all your worries for the big day itself. A civil ceremony can be conducted anywhere within the municipality; on the beach, in the gardens of a villa, or at any one of the municipal buildings. The Ayuntamiento now charges for the use of any of their buildings - 75 euros for mornings on Monday to Friday, 100 euros for afternoons Monday to Friday and 200 euros for a weekend or a fiesta day. One would be forgiven for shuddering a little at the mere mention of paperwork for Spain is renowned at making simple processes that much more difficult. We admit that we wandered somewhat blindly back and forth but simply because we couldn’t find a definitive guide to the required paperwork in Jávea, despite the earnest attempts of both the Ayuntamiento and the Juzgado del Paz. Not that many people get married in Jávea, you see! This is green certificate that is issued by the Foreigner's Office at the Comisaría Local in Denia to prove your residence in Spain as a foreign national and your registration on the Registro Central de Extranjeros. This includes the Numero de Identidad de Extranjero (NIE) which everyone requires to do any sort of business in Spain. Click here to read about our experiences of getting registered. Despite the certificate normally being issued at or just after birth, the Spanish authorities require a "recent certification of birth" which is not more than three months old and these can be ordered online from the UK’s General Register Office at a cost of £9.25 per certificate for a standard service (allow at least 4/5 weeks) or, if you need the certificate urgently, £23.40 each (they claim next working day). This certificate - and indeed any other such certificate issued by the UK - should be presented with an Apostille stamp, an international certification comparable to notarisation in domestic law which supplements a local notarisation of the document. Experiences have shown that it's not always needed but be aware. Once you have received your "new" certificates, you will need to get them translated by an authorised translator. We used Jasmina Lull (jasminalv@yahoo.es) in El Verger who provided translations of both birth certificates for 60 euros. Once we had emailed scans of the documents and answered a few questions about “ineligible” entries, she translated them within 24 hours and we were able to collect them in Jávea. This certificate is issued by the Ayuntamiento as proof of residence within the municipality of Jávea. You need a padrón certificate or certificates to prove at least two years residence in Spain. If you have lived for less time in Jávea but have been living in another municipality in Spain then you will need to present a padrón certificate for that municipality as well so that you can prove at least two years residence. Click here to read about our experiences of getting registered with the local authority. Obviously you will both need to offer a valid UK passport as proof of identity. This is a simple document that proves that there is no obstruction existing that would prevent the wedding from going ahead. For an A4 piece of paper, the certificates cost a fortune and requires contact with the British Consulate in Alicante (tel: 96 521 60 22 or 902 109 356). You also head to the relevant section of the website where you will find more information. Update (05/2016): The certificate is now issued in Madrid and can take some time to obtain so make allowances. This witness should be legally resident in Javea and, of course, be present at the ceremony. 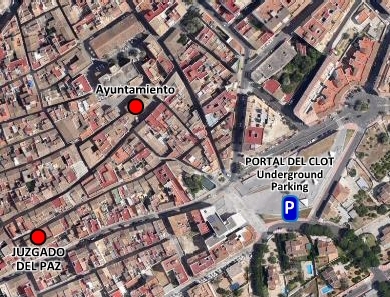 Assuming that you are confident that you have all the required paperwork, you’ll need to visit the office of the Juzgado del Paz in Carrer d'Avall, Nº39 in the old town; it’s just around the corner from the CA Lambert - the green and yellow building in Carrer Mayor - and right next to the Municipal Archive building. It’s open to the public between 10.00am and 2.00pm. When it is your turn, approach the small hatch and explain that you wish to apply for a “Matrimonio Civil”, hand over the file of paperwork that you have spent so long to put together and, providing everything is correct, you will be asked to leave a contact number. You should note that few people speak English in the Juzgado del Paz and if you're not confident of getting your message across or understanding the responses, it might be best to take along someone who can interpret for you. However, they are very patient and this is another perfect chance to practice your Spanish in an authoritative environment. Within a week, you should be contacted to come back to the office (along with the witness) to complete the some official paperwork. Most of the information will have been made available from the submitted documentation but in addition you will have to reveal your educational background (high school, college, university) as well as any professional qualifications and your current employment. Once completed, the documentation will be sent to the Palacio de Justicia in Denia and you will be politely asked to wait. Be aware that this could be several weeks so if you are in a hurry, you can hand-deliver the papers to Dénia yourself and collect them again, normally just a few days later; you will receive a phone call when they are ready. Whilst you are waiting, you should visit the Ayuntamiento to arrange both your venue for the wedding and also nominate the council member who will be conducting the civil ceremony. You can choose any one of the 21 elected councillors – it’s probably best to approach your preferred person and ask them first – and, contrary to popular belief, it doesn’t have to be the mayor. We suggest that you ring the Juzgado del Paz if you haven’t heard from them within a month. With just a few weeks to go until our wedding, we enquired about our paperwork and within days received a phone call from the Palacio de Justicia in Denia with a request to drive over and collect our paperwork from them in person. 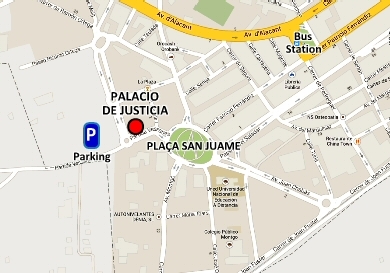 (The Palacio de Justicia is just off the Plaça San Juame I close to the car-park on which Denia’s weekly market is held.) After passing through the security doors, we needed to head up to the second floor to the Fisicalia office to collect the paperwork then take it back to the Juzgado del Paz in Jávea. You may not need to do this. Once the paperwork is complete and returned to Jávea, you will need to confirm your details for the wedding, such as the date and time of the ceremony, the name of the councillor who will be conducting it and, of course, the venue of the ceremony. Many thanks to Bianca Judd and Maggie Morgan for some updates to procedure.